Like so many of us, I serve on nonprofit boards and give back wherever I can, being blessed to do so. In my travels, I have had the privilege to work with John Curtis, Ph.D. is President of IOD – Integrated Organizational Development, Inc. which has been providing analysis, insight and solutions for the capacity building and fundraising challenges of nonprofits since 1999. He recently shared with me a study completed by Dr. Russell James at Texas Tech University about the Effectiveness of Fundraiser Job Titles and that titles DO matter. Dr. James surveyed 3,188 respondents to test 63 fundraising-related job titles in four charitable scenarios: 1) Charitable bequest gifts, 2) Gifts of stock, 3) Gifts of real estate, 4) Charitable gift annuities. The overwhelming results concluded that fundraiser titles with the words “development” and “advancement” signaled the charity was about itself versus the donor. In fact, the worst-performing titles (meaning a donor would not be inclined to engage with the fundraiser) were the traditional organization-focused fundraiser job titles with these terms. The job title generating the lowest overall likelihood of donor contact among all 63 tested was “Director of Advancement” and ALL titles containing the words development or advancement were found in the 10 worst-performing titles. Gift-focused titles appeared to perform better with “Director of Donor Guidance” at #10 of 63, “Director of Donor Advising” #5 of 63, and “Financial Advisor for Donors” #1 of 63. The top three performing titles included “donor” and all referenced a positive benefit for the donor, i.e. guidance, advising or financial advising. The bottom line is that we now have empirical research that shows titles DO matter and changing job titles alone to more gift-centered will enhance donor perceptions. Philanthropy has or should (to capture a larger slice of the chartable pie) move toward the more successful donor-driven approach to fundraising. Being Donor-Driven means working to earn the right to help the donor practice their beliefs or fulfill their personal values or carry on a family tradition by making an investment in the mission of your organization. Looking forward to hearing from you about your nonprofit work! Exactly five weeks after Hurricane Irma struck Florida’s mainland, here’s this morning’s look at where we stand in the key areas of Damage & Claims, Regulation, Legislation, and Recovery. Wind to flood claims are running 4:3, but the larger story is that an estimated 25% of Irma losses in Florida are uninsured. Look for flood damage though to be the big developing story in the weeks ahead. Insurance Commissioner David Altmaier testified before several Florida legislative committees last week, calling Irma “a high frequency but low impact event…whose losses insurance companies’ reinsurance and surpluses are expected to cover.” He said he doesn’t expect any companies to face solvency issues as a result. Neither OIR, the Cat Fund, nor Citizens Property Insurance expect to have to levy emergency assessments on policyholders because of Irma claims payments. Total Estimated Insured Losses as of a week ago Friday (Oct. 6) were $4.57 billion. Altmaier said he believed current industry estimates ranging from $8 billion to $16 billion in total damages for Florida are likely correct. OIR will post updated figures here later today or by tomorrow morning. 703,671 claims have been filed, with 24.6% closed, with a paid to unpaid ratio of 10:7. 1,419 of the above claims were flood claims filed with private carriers. In addition, FEMA reports 24,316 National Flood Insurance Program (NFIP) Florida claims filed as of last Monday, with about 8% closed and total insured losses paid of $72 million. But for every two claims NFIP paid, there were another 17 they didn’t pay. We wonder why? The average NFIP payout in Florida is $25,000. 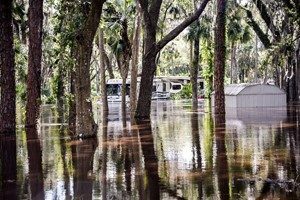 Commissioner Altmaier told legislators he believes flood losses alone in Florida could exceed $4.5 billion and that certain areas of the state could see flood losses that exceed wind losses. We also wonder how many properties will be designated as having “substantial damage” requiring potential added homeowner cost to meet current building codes? And how many in the end will turn out to be repetitive loss properties, which alone are historically responsible for 30% of the national claims payouts from the financially upside-down NFIP? As we’ve reported here, Florida has 15,000 such properties. For those without flood insurance, there is federal aid through grants that require no payback, but the maximum grant is $33,300, with the average paying $4,000 to $6,000 – rarely enough to fully repair/rebuild. FEMA (as of Oct. 2) says it had approved 144,407 applications and provided $124.4 million to repair damages to Florida homes and businesses that aren’t covered by insurance. Citizens Property Insurance Corporation, the state’s insurer of last resort, reports almost 54,000 claims as of last Tuesday – heavily concentrated in South Florida – and expects only 70,000 claims in total, half of what it expected as the storm approached. The gross estimated loss is $1.2 billion. President & CEO Barry Gilway testified before legislative committees last week that if Irma would have gone through Miami-Dade and Broward Counties, Citizens would have a significantly higher claims amount of upwards of $2 billion. The Cat Fund he said would have been on the hook for a larger amount than the $193 million in excess of deductible it will be picking up as of today. Gilway said Citizens’ 1,354 adjusters have delivered an average adjusting time of 13 days from FNOL. The Department of Financial Services reports of the 703,671 claims filed just 154 formal complaints against insurance companies have been filed, with no particular trend noted. Commissioner Altmaier is urging consumers to file claims even if they don’t exceed the deductible, in order to get credit toward damage from any further storms that could occur this season, given that hurricane deductibles are effective by calendar year. He agreed with Rep. Sean Shaw (D-Tampa), a former state insurance advocate, that he too, has heard complaints from consumers about high hurricane insurance deductibles (which are typically 2-5% of the total policy coverage) and was committed to better educating the public on this subject. The Florida House Select Committee on Hurricane Response and Preparedness had its first hearing last Thursday to receive updates on Irma and begin listening to what worked and what could have worked better on critical issues related to state disaster policy. Representatives of several counties expressed concern whether they’ll receive timely disaster reimbursements from FEMA, given such delays last year associated with Hurricane Matthew. Among the issues the committee will tackle this fall, according to House Speaker Corcoran, will be protection of the elderly, disabled, and other vulnerable populations as well as to look at evacuation and mitigation challenges for future storms. This follows the death of eight residents of the Broward County nursing home left without air conditioning post-Irma. Read the Speaker’s Memo here. The high frequency of claims from Irma has created a big need for more adjusters to handle those claims. A KPMG survey of 300 senior insurance executives revealed a lack of claims handling personnel is considered a significant risk to those insurers. The need for adjusters is in the thousands. Likewise, there’s a shortage of roofers. With tens of thousands of properties with significant roof damage, roofers are overwhelmed, and one Orlando television station reports that roof repairs in Central Florida could take months. In the meantime, the U.S. Army Corps of Engineers through its Operation Blue Roof is offering a free tarp to qualified homeowners with standard shingle roofs that have less than 50% structural damage. Too many oranges knocked to the ground (called “fruit drop”) by Irma’s heavy winds dealt a big blow to Florida’s citrus industry, with damages now estimated at $760 million. Growers are seeking additional help from the legislature, beyond the $25 million emergency-loan program for growers that Governor Scott activated after the storm. Florida Citrus Commission chairman Ellis Hunt, Jr testified before legislators last week that many growers don’t have crop insurance because “it’s expensive and ineffective.” At risk as well he said: the jobs of some of the 45,000 who work in the industry. The USDA predicts Florida citrus production will fall 21%, a figure state Agriculture Secretary Adam Putnam said was too low. One down and four to go. That’s the count of committee weeks leading up to the January 9, 2018 launch of the Florida Legislative session. The Oct 9-13 committee week was packed with topics including the budget, mandated generators for senior living facilities, economic development incentives, sea level rise, and a push to show tourists that the Keys are back and open for business. There were committee meetings to focus on Hurricane Irma’s impact on the environment, on agriculture, on schools, on healthcare, on business, on travel/tourism and much more. There were also some substantive debates on proposed legislation affecting everything we do from how we access physicians to sparkler and fireworks sales practices. For a complete list of links to keep you in the know as the Legislature unfolds, please see the end of this and every Bill Watch. As of this past Friday afternoon, 464 bills had been filed. The Legislature is required to pass but one bill a year – the state budget. Please let us know if there’s a particular topic you want to follow and we can point you in the right direction where it will be discussed if a bill is filed to change it! Hurricane Irma Damage – Florida House Speaker Richard Corcoran has created a Select Committee on Hurricane Response and Preparedness to consider critical issues related to state disaster policy post-Hurricane Irma. Among those issues, said the Speaker, were protection of the elderly, disabled, and other vulnerable populations as well as to look at evacuation and mitigation challenges for future storms. This follows the death of eight residents of the Broward County nursing home left without air conditioning after the storm. Read the Speaker’s Memo here. The committee held its inaugural meeting last Thursday and received a primer on Florida’s Emergency Management System, an update on hurricane response and recovery, as well as a claims update from the Office of Insurance Regulation (OIR), all viewable here. Additionally, nine Senate committees last week held briefings on the hurricane, content-specific to each committee’s oversight, including impacts on insurance, state revenues (Senate Appropriations Chair Jack Latvala said the budget outlook is “grim”), tourism, public utilities, infrastructure, and at-risk populations (such as nursing homes and assisted living facilities). Personal Injury Protection (PIP), also called No Fault Insurance – Rep. Erin Grall (R-Vero Beach) has filed HB 19, the second year in a row in her attempt to repeal Florida’s PIP laws. This year’s version is different from her 2017 version in that it does not require mandatory medical payments coverage but has the same mandatory Bodily Injury (BI) coverage requirements starting January 1, 2019. In addition, this bill attempts to provide coverage for “resident relatives” of the named insured in the household. HB 19 revises the uninsured and underinsured coverage legal damage thresholds. We will report more about these changes as the session progresses. The issue of keeping PIP in law or eliminating it has been the subject of debate for almost two decades. HB 6011 by Rep. Julio Gonzalez (R-Venice) deletes the requirement for policyholders & health care providers to execute disclosure & acknowledgment forms to claim personal injury protection benefits. These requirements were originally established to help prevent fraud and include verification that actual services were rendered and weren’t solicited by the provider. While we have not had a personal conversation with Rep. Gonzalez to understand the catalyst behind this bill, we surmise that as an orthopedic surgeon, lessening the insurance paperwork burden for medical providers has long been a goal of those in the profession. This bill appears to be a step in that direction. The bill has been referred to the House Insurance and Banking Subcommittee. Assignment of Benefits (AOB) – In the Senate Banking and Insurance Committee, Chairman Flores presented an outline (here on pages 67-70) to frame the assignment of benefits debate. Panelists representing the plaintiffs bar, insurance defense bar, insurers, regulators and vendors were asked by Chair Flores if they would support the first few provisions of this outline with promises that the discussion would continue in the next scheduled meeting. The debate was spirited and we will follow closely in hopes that Senator Dorothy Hukill’s (R-Port Orange) version of AOB reform (SB 62) gets a hearing, as it prohibits certain attorney fees and requires those vendors that execute the Assignment of Benefits to comply with certain requirements prior to filing suit. Many of you followed this legislation filed last year and it did not move. Suffice it to say that in the past several months, almost every single Florida newspaper and other media have reported about the great consumer harm that is occurring because of assignment of benefits abuse. Hurricane Irma repair has revitalized the debate. The CFO has come out swinging about AOB on the Florida Chamber’s Bottom Line program and Insurance Commissioner David Altmaier has made AOB reform his top priority. Citizens Property Insurance Corporation’s attempt to address AOB abuse –the implementation of a managed repair program with a $10,000 water claim limit for those who don’t use the program — was approved by OIR in August for Citizens HO-3 and DP-3 policies. AOB abuse is now increasing in the auto insurance lines, as insurance companies note an increase in customers being solicited out of the blue for a “free windshield” with accompanying exorbitant claims costs. Senator Hukill has a bill for that, too, in SB 396, which would allow auto insurers to require an inspection of the damaged windshield of a covered motor vehicle before the windshield repair or replacement is authorized. The bill has not been assigned to committees yet. In a recent conversation with a circuit judge, we asked what kinds of cases made up his judicial docket. He couldn’t be specific but said he “keeps seeing more and more windshield cases.” We have begun the research to ascertain in certain judicial circuits if we can show the exponential increase in windshield cases over the past few years. SB 256 by Senator Gary Farmer (D-Ft. Lauderdale) would prohibit insurer managed repair programs and prevent most property insurance policies from prohibiting or limiting AOB. But it would also require the AOB be in writing, be limited to an accurate scope of work to be performed, and allow the policyholder to cancel the AOB within seven days without penalty and otherwise, be shared with the insurer within seven days of execution. A final repair bill would be required to both policyholder and insurer within 7 days of work completed. Referral fees would be limited to $750 and require water damage remediation assignees to be ANSI certified. Insurance companies would be required to offer any settlement within 10 days of assignee filing suit over an AOB dispute. It also prohibits insurers from including the costs of attorney fees paid in losing cases into their rate base or future rate requests. Under the bill, OIR would be required to conduct an annual AOB data call beginning in 2020. SB 256 has been referred to the Committees on Banking and Insurance, Appropriations, and Rules but has not been scheduled to be heard. Insurance Rates – SB 258 by Senator Farmer would prohibit insurance companies from including the costs of attorney fees paid in losing cases into their rate base or future rate requests in Workers’ Compensation and Life policies. Farmer’s similar bill in the 2017 session failed. SB 256 has been referred to the Committees on Banking and Insurance, Appropriations, and Rules but has not been scheduled to be heard. Direct Primary Care & Health Insurer Authorization – SB 80 by Senator Lee, and bills SB 98 and SB 162 by Senator Greg Steube (R-Sarasota) deal with health insurance and allow doctors to contract directly with businesses or others to provide healthcare, essentially bypassing health insurance organizations; address reforming the use of the prior authorization process; and prohibit health insurers and HMOs from retroactively denying insurance claims. We will closely watch these as well, as SB 80 has a similar bill (HB 37) by Rep. Burgess in the House. SB 80 was quickly adopted in the October 10 Senate Banking and Insurance Committee and the new version of the bill (called a committee substitute) moved oversight of the direct primary care contracting requirements to the Office of Insurance Regulation versus the Department of Business and Professional Regulation. Senator Lee noted that since it’s an exemption to the insurance statutes, then it was felt this bill belongs in the insurance statutes, not the health policy statutes as originally filed. SB 98 and SB 162 have been referred to the Banking and Insurance, Rules, and Judiciary (SB 98) & Health Policy (SB 162) Committees. Flood Insurance and Mitigation – SB 158 by Senator Jeff Brandes (R-St. Petersburg) provides greater funding for flood mitigation so that more individuals and communities can meet NFIP flood insurance standards. The bill would allow flood mitigation projects to be funded by the Florida Communities Trust to reduce flood hazards. Senator Brandes has for the past 5 years taken the lead in Florida in the flood insurance arena. The bill has been referred to the Committees on Environmental Preservation and Conservation, Appropriations, and the Appropriations Subcommittee on the Environment and Natural Resources but has not been scheduled to be heard. Insurance Credit Scoring and Redlining – SB 414 by Senator Farmer would ban the use of credit scores as a determining factor in calculating auto insurance premiums. Currently, insurers are permitted to use a customer’s credit history as a justification for higher insurance rates. Statistically, drivers with poor credit scores pay more and according to Farmer “the use of credit scores as a determining factor for auto insurance rates has been found to disproportionately affect minority populations, with African American and non-white Hispanic policyholders often paying higher premiums, and is not a reliable indicator for increased risk.” Similarly, SB 410 would prohibit the use of zip codes as a determining factor in calculating auto insurance premiums, which Farmer called “de facto discrimination.” HB 659, which passed and became law in 2016, allows single zip code rating territories if they are actuarially sound and the rate is not excessive, inadequate, or unfairly discriminatory. Neither bill has been assigned committees. Florida Hurricane Cat Fund – HB 97 by Rep. David Santiago (R-Deltona) adds an additional 10% charge to an insurer’s reimbursement premium with the money going to the Division of Emergency Management to fund a wind and flood mitigation program for residential structures. The charge would increase to 15% and remain there until the fund reaches $10 billion. It also contemplates OIR levying an emergency assessment to cure certain deficits in the fund. The bill also revises reimbursements the SBA must make to insurers to add a 25% and 60% level of insurer’s losses from each covered event in excess of the insurer’s retention and the overall contract year obligation. The bill has been referred to the House Insurance and Banking Subcommittee meeting. Health Insurer Authorization – SB 98 by Senator Steube and HB 199 by Rep. Shawn Harrison (R-Tampa) would prohibit prior authorization forms from requiring information not necessary to determine the medical necessity or coverage for a treatment or prescription; requiring health insurers and their pharmacy benefits managers to provide requirements and restrictions on prior authorizations in understandable language and to make them available on the internet, along with a 60-day notice of any changes. SB 98 has not been schedule to be heard. Both bills have been referred to their respective insurance committees. Workers’ Compensation for First Responders – SB 126 by Senator Victor Torres (D-Kissimmee) and HB 227 by Rep. Matt Willhite (D-Royal Palm Beach) removes the requirement that there be a physical injury in order to receive medical benefits for a “mental or nervous injury”, so long as the responder witnessed a specified traumatic event and begins treatment within 15 days. Neither bill has been scheduled to be heard. Patient’s Choice of Providers – Dubbed the “Patient’s Freedom of Choice of Providers Act”, HB 143 by Rep. Ralph Massullo (R-Beverly Hills) prohibits a general health insurance plan from excluding willing and qualified health care provider from participating in a health insurer’s provider network so long as the provider is located within the plan’s geographic coverage area. The bill has been referred to the Health Innovation Subcommittee. Telehealth – SB 280 by Senator Aaron Bean (R-Fernandina Beach) is part of a continued effort to put remote health practitioner visits via the internet on an equal footing as in-office visits, in order to reduce health costs and provide parity of care to rural patients. A state panel has spent the past year executing a list of legislative directives to help smooth the kinks and establish recommended procedures to help make this bill a reality. SB 280 would establish the standard of care for telehealth providers; encourage the state group health insurance program to include telehealth coverage for state employees; and encourage insurers offering certain workers’ compensation and employer’s liability insurance plans to include telehealth services. The bill has been referred to the Banking and Insurance; Health Policy; and Appropriations Committee, as well as the Appropriations Subcommittee on Health and Human Services, but no hearing has yet been scheduled. If you had a debt of $25 billion and your favorite, rich aunt said she would give you $16 billion to “help” you unconditionally take care of your debt so you can use your credit card to shop some more, would you accept the gift? We doubt there would be many of our readers who would say no! And that’s exactly what the U.S House of Representatives is saying to the National Flood Insurance Program (NFIP) with last week’s vote of 353 to 69 approving a debt relief bill that is expected to be considered by the Senate this week. It’s part of an overall $36.5 billion disaster relief bill. Four reasons Congress is considering checking the couch cushions for debt relief: Hurricanes Harvey, Irma, Maria and Nate. No state is more thrilled to hear this good news than Louisiana, with its Congressmen Graves, Kennedy and Cassidy, and Scalise (who is from Jefferson Parish and a congressional majority whip) all applauding the debt relief. The aid bill blossomed from a $29 billion package the Trump Administration submitted nearly two weeks ago, that included some strings attached that go right to the heart of NFIP reauthorization. White House budget director Mick Mulvaney wrote in his request letter to Congress that by the latter part of this month, the NFIP will have fully exhausted its financial resources, including its $30.4 billion in borrowing capacity. “The NFIP is simply not fiscally sustainable in its present form,” Mulvaney wrote, noting the program is not designed to handle catastrophic losses like those caused by Harvey, Irma, and Maria. Mulvaney proposed changing the program to encourage a private flood market, establish a means-test for any future subsidized rates, protect low-income policyholders from large rate hikes, drop properties from the program that repeatedly flood, and phase-out policies on new building in flood zones. However, none of the White House ideas are currently in the congressional debt relief proposal. The Florida Realtors® and the Florida Homebuilders Association oppose the Trump measures – as do Louisiana and its congressional delegation. Caitlin Berni, vice president of policy and communications for Greater New Orleans Inc., a regional economic development group that has focused extensively on flood insurance issues, said the White House proposals would effectively end construction in large swaths of flood-prone south Louisiana, make flood insurance unaffordable for many or even boot homeowners out of the program. In essence, Louisiana “repetitive loss” existing properties are grandfathered into subsidized flood insurance premiums so that these homeowners generally enjoy lower premium prices than they’d have to pay based on updated flood maps. Several in Congress would prefer NFIP recalculate premiums to more accurately reflect flood risks and kick properties that have flooded more than once out of the NFIP, arguing changes are needed to put the program on sounder financial footing. Environmentalists complain that the NFIP effectively subsidizes new development in flood plains that destroy wetlands and leave areas more vulnerable to natural disasters. Louisiana leaders blame the failure of federal levees for the flood losses and contend that Louisiana residents shouldn’t be saddled with higher premiums for a peril caused by the federal government. In addition, another Louisiana congressman says more people should buy flood insurance to spread the risk. Ironically, the $16 billion figure is the exact amount that is estimated to cover the costs of recovery for the first three hurricanes this year and if those projections prove accurate, the NFIP would be left with the same debt load it head earlier this summer once claims are settled and paid. Florida businesses could see an average 9.6% reduction in workers’ compensation premiums in 2018 under a rate filing the Office of Insurance Regulation will consider this Wednesday during a public rate hearing. The filing includes a statewide average rate decrease of 9.3% and a $40 reduction in the fixed expense cost of each policy. All of this, despite dire predictions that rates would increase as a result of Supreme Court decisions on three key cases in the past year. This past week in Tallahassee, David Langham, Deputy Chief Judge of Workers’ Compensation Claims (JCC) disputes, presented to the House Commerce Committee. Among other panelists, he provided an update on the state of workers’ comp litigation in Florida. He opened with statistics about the increase in litigation and attorney fees since the three landmark court decisions in the past 18 months reversed provisions in the current workers’ comp law. On average, there are about 30,000 cases a year that are disputed and wind up in the JCC offices and that number has remained reasonably static until about 3 years ago. Since 2016 there’s been a 0.4% increase in cases, and a 5% increase in petitions filed in 2017. That petition increase followed a 12.4% increase in 2016. Langham said that the prevailing discussion is that the rise in disputes can be put in two categories – the removal of the cap on attorney fees and the inexperience of workers filling jobs they might not be suited to perform because of the low unemployment rate. Langham likened the JCC process and his 31 judges to a dam that workers’ comp fee requests must flow over to get paid. How fast the attorney fee claims reach his judges’ desks is not a factor over which he has any control. He said that in 2017, statutory attorney fees decreased from $16.3 million to $11.3 million. Hourly attorney fees, precluded on many cases by statute prior to Castellanos, increased from $26 million to $75 million in 2017. There is speculation that some lawyers were holding their attorney fee requests to see the outcome of the Castellanos decision which removed the $1,500 cap and established a “reasonable” standard. Settlement of workers’ compensation cases also demonstrated interesting change in 2017. The total number of settled cases decreased about 1%, from 26,205 in 2016 to 25,952 in 2017. The total dollar value of settlements also decreased by about $3 million. However, the attorney fees paid from those settlements to the claimant’s attorneys increased by about $4.5 million, a 5% increase. One point the Chief Judge highlighted is that attorneys are taking more money from their clients related to settlements. Additionally, the average hourly rates being collected by claimant attorneys increased from $185 an hour in 2016 to $260 in 2017. Florida insurance regulators have made 11 rule changes that impact companies wanting to do business in Florida, including Surplus Lines and Alien Insurers. The Office of Insurance Regulation (OIR) filed notices of withdrawal earlier this month on Rules on Foreign and Alien Insurers Filing for a Certificate of Authority (69O-136.002) and Domestic Insurers Filing for an Application for Permit (69O-136.006). It’s part of a streamlining effort to eliminate duplication and to provide for electronic filing and adoption of forms currently in use for issuing Certificates of Authority to insurers. Similarly, the following rule changes are part of an effort to eliminate redundant or obsolete forms and adopt forms currently in use by OIR. They are Surplus Lines (69O-136.004), Captive Insurers (69O-136.005), Domestic Insurers Filing for a Certificate of Authority (69O-136.011), Forms Adopted (69O-136.012), Procedure to Amend an Existing Certificate of Authority to Add a New Line of Business (69O-136.015), Determination of Eligibility to Operate as an Alien Insurer in Florida (69O-136.018), Registration as a Purchasing Group (69O-136.031), Registration as a Risk Retention Group (69O-136.032), Uniform Certificate of Authority Expansion Application (69O-136.034). The Governor and Cabinet, sitting as the Financial Services Commission which oversees OIR, approved all 11 changes in its August meeting. The past few weeks have been stressful for our entire state with the ravages of Hurricane Irma and the threat of Hurricane Nate. But there is another level of stress that many Floridians face because they fear they can’t secure a high paying job. This revelation and many more are in the 2017 USF-Nielsen Sunshine State Survey released last week by the University of South Florida. While 6 in 10 Floridians have some level of stress about their financial standing, that figure is down 11% from the 2015 survey. As is suspected, those with the most stress include the unemployed, those with household incomes under $35,000, African Americans, women, and those without college degrees. Also, those living in South Florida, where it costs more than any other part of the state to live, had the highest levels of financial stress. The survey size was about 1200 individuals ages 18 and older, randomly choses and surveyed by telephone. The margin of error is +/- 2.8%. 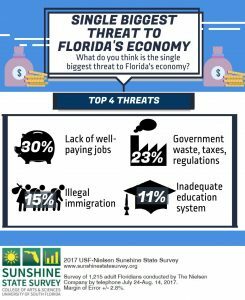 Nearly a third of those surveyed identified the top threat to Florida’s economy as being the lack of well-paying jobs. Other threats included government waste/taxes/regulation, illegal immigration, and an inadequate educations system (see chart at left). When asked to identify the most important issue facing Florida, the economy/jobs is still among the most cited – but barley. In 2008, at the onset of the Great Recession, 56% of Floridians felt so, but today just 14%. Other top issues identified as most important were the environment (13%), education (10%), health care (10%), and crime/policing (10%). Most still question state progress on job creation, with 61% judging it as either fair (40%) or poor (21%). But the optimists are gaining ground, with 35% of Floridians saying state government does a good (31%) or excellent (4%) job of creating jobs – up 7% from last year. The 2017 judicial hellhole report found at www.judicialhellholes.org/ and published by the American Tort Reform Foundation (ATRF) lists courts in Missouri, California, New York, Florida, New Jersey, Illinois, Louisiana, Virginia and Texas among the nation’s “most unfair” in their handling of civil litigation. And according to Trial Behavior Consulting, a Los Angeles based firm that helps law firms, insurers, and other corporations obtain successful trial outcomes, there’s a key reason why the venues listed by the ATRF are losing civil litigation and that key reason is the organization patterns of the lawyers involved. The plaintiffs bar generally is “so much more organized and better orchestrated” than the defense bar, said Marissa Beyers, Trial Behavior Consulting’s senior vice president who spoke at the 2017 Claims & Litigation Management Alliance (CLM) & Business Insurance Construction Conference last week. The old adage that you can size up a person immediately after the first impression holds true in the courtroom and the plaintiffs bar has used that instinct as the foundation for their success. The lesson for defense teams working for insurance companies: It’s time to get your act together. Among the problems discussed at the conference were letting associates do too much of the work before trial without adequate supervision by partners, a lack of training for newer insurance adjusters making careless mistakes, and failing to remember the old law school adage that “the best surprise is no surprise” in court. And we certainly know that some defense lawyers’ strategy is to strive to settle the case – to the point where they can be surprised when it becomes inevitable the case is going to go to trial. By then, aggressive, better motivated, and better organized trial lawyers have already spent weeks in trial preparation, leaving their defense adversaries flatfooted. Beyers points out that plaintiffs attorneys are very adept at eliminating potential jurors that seem better educated and thus more objective with the evidence and likely to understand and side with the defense. The judicial hellhole designation, she said, is given when there are “two major issues at play,” the first being a “more liberal and challenging bench,” and the second, “the nature of the venue itself” and the “type of jurors you’re likely to get.” She pointed out that South Florida courts, especially in Broward County, are particularly bad on those counts. We opened this newsletter with ways to put some life into nonprofit work. As we approach this holiday season, there will be so many Floridians who have not rebuilt their lives post Irma, Harvey and Maria. Please remember to try to include in your budget ways to financially support your favorite charity and better yet, a way to share a smile with those who need it. I performed a wedding ceremony this past weekend and the bride and groom asked that I be sure to express their gratitude to those in attendance with, “thank you for your presence here today, and for your blessing, encouragement, and lifelong support…” Isn’t that the least we can do for those in our world?